We offer Vertical Plastic Injection Moulding Machine that are highly appreciated for providing complete plastic processing solutions. Owing to their high-grade quality and reliability, these machines are widely demanded in the market by our valuable customers. 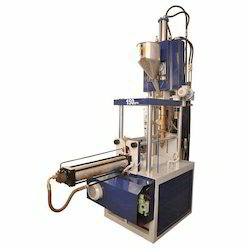 These Plastic Blow Moulding Machine are fabricated with high grade plastic body the machine & latest technology. Vertical Type Fully Auto Plastic Injection Molding Machine is manufactured with the help of supreme grade material and contemporary tools in compliance with set industry norms. We offer qualitative range of Fully Automatic Vertical Plastic Injection Molding Machine that are employed in various industries. Our Fully Automatic Vertical Plastic Injection Molding Machine model comes with Fixed Van Pump AC Drive / Variable Displacement Pump / Servo System, PLC Controller, Hydromotor, Ejector & etc. HDPE Fitting Moulding Machine offered comes designed and developed using latest technology support and perfectly match up to the requirements of delivering reliable and durable pipe fitting molds. Here, our expertise lies in also making these available in OEM & ODM finishes. Some of the working features if the machine include allows development of molds using different finish materials; can develop molds using single/multi cavity choices; latest design software support for flawless results; assure of high mold life.